If you are ready for heating installation in Troutman, give us a call. Whether you are completing new construction in Troutman, North Carolina or are simply ready for a new heating installation, there are several heating options available. If you give us a call at Cool Comfort Heating & Air, we can discuss your unique needs and determine which type of system would be best for your heating installation. Furnaces work by blowing heated air through a ductwork system and delivering hot air to each room through registers or grills. The heat for a furnace can be created by fuel oil, natural gas or electricity. Furnaces have become much more energy-efficient in recent years. Boilers are basically specialized hot water heaters. Instead of sending hot air throughout your building, they distribute hot water in radiators. Usually the heat is created with heating oil or natural gas. There are also systems that rely on sending hot water through special tubing in the flooring. 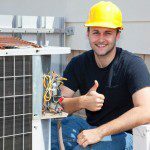 Heat pumps are essentially air conditioners that can work in two directions. In the summer, they remove heat from the inside of your home or business, and in the winter, they remove heat from the exterior and bring it inside. For some individuals willing to make a larger investment to improve efficiency, a ground source heat pump might be a good choice. Whatever type of heating installation you require for your property in Troutman, we have the knowledge and experience to install it quickly and correctly. So call us today. At Cool Comfort Heating & Air, we provide high-quality heating installation services in Troutman, Mooresville, Huntersville, Cornelius, Denver, Lake Norman, and Davidson, North Carolina.